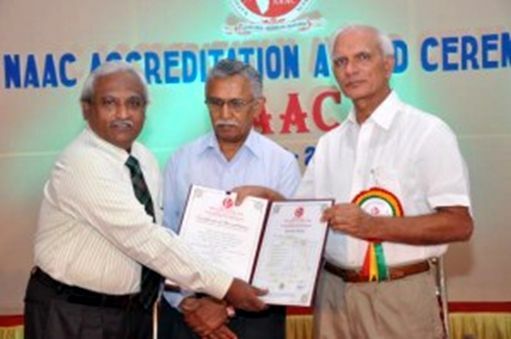 The National Assessment and Accreditation Council was established as an autonomous institution by the University Grants Commission to assess the quality of education imparted in institutions of higher learning in the country. The purpose of assessment is to make quality the defining factor of higher education in India through a combination of self and external quality evaluation, promotion and sustenance initiatives. Moreover the value framework designed by NAAC paves way for higher educational system, contributing to national development, fostering global competencies among students, inculcating value system among students, promoting the use of technology, quest for excellence and on the whole promoting total quality in higher education. Gyan Jyoti College, having completed seven years of its establishment decided to go for NAAC inspection to have a scientific external evaluation. The NAAC Peer Team visited the college on 16th, 17th and 18th January, 2012 and after a thorough inspection, having had extensive interactions and studies was immensely pleased with the physical infrastructure and human resource potential. The college was awarded B grade (score: 84%) on the four point gradation system, which stands testimony to the quality of education imparted. The College is striving hard to improve the quality as per requirement every year and will excel in the years to come.